At the Easter Wagner Festival in Berlin in 2002 a young Heldentenor caught my attention singing the diverse roles of Erik and Lohengrin. His name was Stuart Skelton and in the intervening years this Australian born singer has emerged as one of the leading exponents of some of opera’s most challenging roles. I saw him recently in Die Walküre in the developing Hamburg Opera Ring cycle and said in my review that he was a ‘lyrical, effortless Siegmund’. In May 2009 he gave a remarkable interpretation of Peter Grimes for English National Opera and it caused Edward Seckerson (The Independent) to write ‘If ever a singing actor combined the elemental force of a Jon Vickers with the crazed inwardness of Pears, it is he.’ With a few days left before the dress rehearsal of the eagerly awaited new production by David Alden of Janáček’s Katya Kabanova in which he sings Boris Grigoryevich, Stuart spoke to me about this, as well as, his background and the recent success he has had. Stuart was born in Australia and I wondered what his first memory of opera was and how his interest in music had begun. It was 1984 and I saw Richard Bonynge conduct Joan Sutherland as Madame Lidoine in Dialogue of the Carmelites at the Sydney Opera House. Growing up I was interested in rugby and Formula 1 but I came home one day, I must have been 6 or 7, and said I wanted to learn to play the piano and having started, unlike some who just do it for a month or so, I just kept going. When did he become serious about singing? Well, when I got to St Andrew’s Cathedral School I was in the boys’ choir and there were services on Tuesdays, Wednesdays, Thursday and twice on Sunday; we were practicing any new repertoire every morning and, of course, rehearsing for the services. I never wanted to sing for a living and was studying, albeit unsuccessfully, to be a lawyer when at University. However my singing teacher at the time entered me for a singing competition and in the first year I got through to the finals and then the second year was awarded first prize. So the following year I entered the largest competition for singers in Australia sponsored by McDonalds who were the largest contributor to prize money in classical music at the time. That was in 1993 and I won and was lucky to take out [laughs] what was affectionately known as the ‘Big Mac’ prize of 30,000 Australian dollars with a further 5,000 Australian dollars air fare. One of the conditions of the McDonalds’ scholarship is that to avail yourself of the funds you must leave the country and cannot spend it in Australia. I had to decide where to go next and went to the University of Cincinnati and did a Master of Music degree there. Of course, American universities aren’t cheap so the scholarship was invaluable. I went from there to a fellowship programme for young artists at San Francisco Opera for two seasons and the rest is history [laughs]. I wondered how he had decided to go to Cincinnati and what it is like studying there. Firstly, because it was recommended to me and secondly, the lady to whom I am now married had already been accepted there. The Midwest universities of Indiana and Cincinnati have so much real estate available to them and the facilities at Cincinnati were almost inconceivably luxurious. I was on a graduate school programme with between 17 and 22 Masters candidates in the first of its two years. This is a university that does 7 operas in every academic year; two main stage productions with four performances each and then maybe 4 or 5 smaller theatre productions with two or three performances. That is just the opera department and there is also the theatre department there with a completely separate programme but they have the use of the same theatre. Operas ranged from Hindemith’s Hin und zurück that lasts for only 25 minutes with a cast of just three and requires only a small auditorium to Falstaff that was the big one at the end of the second year. There was also a recital requirement, as well as, the demands to keep up a 75% or three point grade average for your academic work because it is a college conservatory. I asked whether the quality of his training explained the great success of American singers – and others like himself - who have studied there. Americans take the success very seriously of everyone who comes out of an academic institution, whether they be doctors, lawyers, singers, violinists, or conductor. All your colleagues are genuinely happy for you if you have success and it is something to be emulated and not envied. For me this is part of the American way of life and there is this commitment to excellence. Whatever you needed at that school to get you over the next hurdle was something that the entire school and everyone of its faculty members was prepared to help you with. I owe them a great deal. Had Stuart always sung as a tenor and who does he credit for his development as a singer? Well when I was in the Cathedral choir I sang in the basses but when I went to my first singing teacher he did say it could go either way. At Cincinnati I was asked ‘Who was it who said you were a tenor?’ and I was told that if I was to go and ask 100 people, 50 would say tenor and 50 baritone. I am very happy that all my teachers during my whole progression recognised there was something in my voice that was going to mean that the baritonal colour didn’t suggest I was actually a baritone but meant I was a true tenor who could use the colour for certain parts. Especially for me, Professors Barbara Honn and Tom Baresai who taught me at Cincinnati were invaluable and so kind to me. Most recently I have been working with Ruth Falcon in New York who has an absolutely sensational ability to listen and make the constant little adjustments you need when you are on the road ten months of the year and there is no chance for regular lessons. When you are on stage pumping out the production every day, little bad habits can creep in and Ruth has been terrific for me as she can put everything back into line. Generally I am gratefully to everybody for the integral part they have played in my whole development. Stuart has been collecting an impressive array of major nominations and awards in recent years and he must be happy with that. It’s all very exciting. The 2005 Helpmann award for ‘Best Male Performer’ that I got for Siegmund for State Opera of South Australia is to all intents and purposes the Australian equivalent of the ‘Tony’s’ or ‘Oliviers’ and are awarded for live theatre. I knew nothing about the Académie du Disque Lyrique in Paris until I won their inaugural ‘Prix Lauritz Melchior’ for the Melba CD recording of that Siegmund. With Melchior’s name attached to something, it is a double-edged sword [laughs]- it’s great to be compared with him but you have to live up to it as well. He has been nominated for ‘Outstanding Achievement in Opera’ at the 2010 Oliviers for Peter Grimes and this performance gained him many favourable comparisons to famous exponents of the role in the past. I asked what he thought about that. I’ve had a remarkable run of being compared to other people. With Grimes I was compared to Ben Heppner and Jon Vickers and as Siegmund I was compared to James King. This is very illustrious company and no one could have known that the three people whose careers I would most like to emulate are, indeed, James King, Jon Vickers and Ben Heppner. Each, in their way, is for me a giant of the repertoire I sing. These artists had – or in Ben’s case still have – an impeccable musicianship and musicality and a real need to make the characters they portray work, doing more than just stand and sing. There is a such a lot of lyricism about Wagnerian and Straussian repertoire and also the music of Beethoven, Janáček, and Dvořák, that requires a beauty of tone, melody and cantilena and this is what King, Vickers and Heppner have. I wondered how it had been, singing Grimes to such acclaim last year and whether he felt any pressure because of those associated with the role. Never more so than to do a new production of that opera in this Coliseum theatre. Although Peter Grimes wasn’t premièred in this building it was put on by this company in its previous guise. To have Edward Gardner in the pit with all the great feeling he has with his orchestra and all my wonderful colleagues it was unbelievable. It wasn’t pressure but I felt a real sense of occasion. We knew everybody was not going to love every second of the production – no one ever does – but the one thing you cannot say about David Alden, and I have been lucky to work with him three times now, is that no one walks away from one of his stagings unaffected by it. Certainly it was an absolute privilege and honour to bring that opera - and that role in particular - to an audience for whom it is most dear above everything else. You have to be aware of that but the reception from both the public and the critics was a vindication for all of us that we had made compelling theatre and that was the most important thing. Now Stuart is back working with David Alden on his new production of Katya Kabanova, I asked how this had been going. Well we first did some Janáček together in 2006 when I sang in Jenůfa and I think it is wonderful how his works have been taken to the hearts of the British people and within days of own first night there is Cunning Little Vixen at Covent Garden so it’s the Janáček mafia in London at the moment [laughs]. I think this production it is sensational and again it is a great cast and there is the huge coup of having Patricia Racette come and sing Katya. She is an absolute angel to work with and a stunning singer. It is a very strong show and the orchestra are playing just brilliantly for Mark Wigglesworth who is doing a great job. It’s very exciting and I cannot wait for opening night to see what the public will think of it. We are going straight through the piece in one hour and forty minutes and that will be great to keep the tension of the drama going. I think that is why Janáček composed the intermezzi and it is clear from the score that if you need more time the music can be repeated. It is amazing that he envisaged that as a way to get through it. And for me I have a bit of a change of character and get to play a morally lazy cad. I asked Stuart whether Boris isn’t in some respects a bit like Erik in Der fliegende Holländer. A bit – but the difference is that Erik does want to be with Senta and she rejects him, here in this opera Boris is a bit ambivalent about the whole thing. He might have stayed with Katya but towards the end of the opera she becomes more trouble than she is worth for Boris and he is happy to take his ‘escape clause’ and get himself out of the relationship. Was Stuart happy to be singing this opera in English? Absolutely. There are some operas, particularly those in Czech, that benefit from being sung in English though you do have to spend a great deal of time at the beginning of the rehearsal period making sure that the words have a real relevance for the audience. Some long-standing translations can become slightly old-fashioned over time. More generally the question about translating operas into the vernacular is a difficult one and there are some operas with mystical libretti that you would be hard pressed to pull off successfully in anything other than German. I’m thinking of something like Die Frau ohne Schatten that is inscrutable enough in German and I cannot see how translating it into English would make it any easier [laughs]. Wagner was always an advocate of having his operas performed in the language of his audience – so if it was good enough for him that’s the brief to a certain extent [laughs]. I reminded Stuart that I was following the building up of Claus Guth’s Ring Cycle in Hamburg where he had performed Siegmund and I wondered about his thoughts on that production and the cycles he had already been involved with. The whole thing about the concept in Hamburg is that Wotan is being shown demonstrably in control of what’s going on. That is why in Rheingold there was a large map of the world and why in Walküre that plan has been abandoned. The map is now in wrapped in plastic and up against a wall in Valhalla and Act I had been played out on a huge – for want of a better description – ‘Etchasketch’ tablet and our movements were determined by that. Particularly if you do productions of Wagner in Germany, you must be mindful that every member of the audience knows these works intimately. So I think doing the old Metropolitan Opera’s version of it would be a bit boring for German people. I think it is stunning to look at, as was the 2004 production in Adelaide, though there was nothing remotely realistic about it. It was spectacular where it needed to be, funny where Wagner wanted it to be and great drama. I found that was also true with the current Seattle production though that is seriously realistic in terms of the mountains, rocks and trees. It doesn’t matter whether it is opera on the grandest scale or a small piece with 2 or 3 characters in it – what really is important is the relationship between the characters. In Wagner you get the added relationship between the characters on stage and the relationship with the characters as music played by the orchestra. Something will be said on stage but belying what they are saying will be the orchestra playing what they are really thinking. There is an incredible intimacy in that so it doesn’t matter what scale it is all displayed on – it is that intimacy between words and music that wins every time. Stuart has sung Erik. Lohengrin, Rienzi, Siegmund and Parsifal and I wondered what Wagner he saw himself singing next. I can’t see myself singing both Siegfrieds though the more I think about it, Tristan becomes an inevitability but I am not going to rush to explore that. Mind you I do know the role and have on occasions taken the score out and had a bit of a sing through it - though just remembering Act III is a gargantuan task and that would be my first job. For me the Siegfrieds require a completely different quality of voice and it is something I just don’t have. The younger Siegfried doesn’t necessarily fit with the bronzy rounded James King type of voice production. I would have loved to have heard Melchior sing the role in the theatre because he was the Siegfrieds par excellence but then again Melchior’s voice, though baritonal, hadn’t this rounded sound but a genuine edge to it and the steel that a Siegfried has to have. Another reason to keep trying to avoid this role is that once you’ve done it people tend not to ask you for anything else. For me it is best to do the things you can do and as your voice matures maybe try out other things and if they work mention it to people … and if not, you don’t. I love being able to have all my other roles, as well as, the Wagner in my repertoire, such as Don José, Florestan, Samson and Canio, because they require different things from your voice and it keeps its flexibility. I also like revisiting parts I have done before because you can discover different things in a score with different conductors and that can be as much fun as doing new roles. There was a new role for him recently when he performed Mitch in André Previn’s A Streetcar Named Desire, I asked what he thought about being directed in Melbourne last December by a fellow Australian, the film director, Bruce Beresford. It was the most amazing experience of my life; the score has some amazing music in it, the set was gorgeous and Bruce’s concept of how everything should come together was sensational. He was absolutely fastidious to the point of annoyance on making sure we never resorted to what he called ‘funny opera faces’. Although it drove us to distraction for the first couple of weeks of rehearsal it didn’t take us long to realise exactly what he meant. He looked at the piece incredibly filmically and with a work like that you cannot do it any other way. Bruce really knows how to bring real performances out of people and once you understood what he was after it was a really incredibly liberating thing to be on an opera stage with 2000 people in the audience and when somebody says something to you just turn your head towards them as you would in real life and through that to portray the drama. Where is home now for Stuart? It’s Florida and when we can get home, albeit may be only for a week or two at a time I can treat it like a holiday because of the palm trees and the warm weather. If you are fortunate enough to be in demand and travelling from place to place it is a bit churlish to complain about having to cart your stuff with you. Living out of a suitcase isn’t much fun but it is part of the job. Any final thoughts on the new Katya? I think it will be fabulous. It is a very strong cast, a strong production with a terrific orchestra playing. Mark Wigglesworth has a real affinity for Janáček and understands how to bring out all the multifaceted parts of his score from its Eastern European sounds to the grand Hollywood MGM moments. I think it is going to be a huge success and we’re all hoping that is the case. 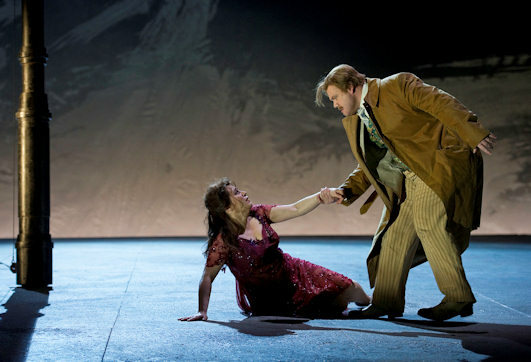 To book for ENO’s remaining performance of Katya Kabanova please go to the website http://www.eno.org/home.php. And for more details about Stuart Skelton visit his own website.